Crystals grow and yet are not alive, and they create order seemingly out of nothing. For these reasons, they have intrigued scientists for centuries. Yet crystals are common and easy to create, even if they take a bit of study to understand. Growing crystals and learning about them is so fascinating that your science fair project might not seem like homework at all. Crystal growing kits are available at online retailers, education suppliers, some toy stores and some craft and hobby stores. Kits run from $10-$30 dollars but with a kit, successful crystal production is virtually guaranteed. Depending on your project and the amount of crystal making material in your kit, you may have to buy multiple kits to compare different experimental groups. The most common homemade crystals are rock candy which can be produced with sugar, a skewer, a clothespin, a glass, water, heat and patience. First make a supersaturated solution of sugar water, adding sugar to boiling water a little at a time until the sugar no longer dissolves. Turn off the heat and allow the water to cool for ten minutes. Pour the sugar water in the glass. Clip the clothespin to the stick so that when you set it on the glass opening the stick is suspended in the sugar water but not touching the sides or bottom of the glass. Wait 3-7 days as sugar crystals form around the stick. The crystals form because the supersaturated solution is able to hold less dissolved sugar as it cools. The sugar molecules' structure forces them to bond to each in regular repeating patterns. For some science fair projects, simply demonstrating crystal growth may be adequate, but for others you may need to carry out some sort of experiment. You might test the effects of slowing water evaporation by covering the glass during crystallization. You might see what effect different temperatures have on the crystallization process. You might test different kinds of sugar to see if they create different kinds of crystals. Crystals are organized grouping of atoms or molecules. Some substances' atoms link together in a regular pattern that is repeated over and over again. These substances naturally form crystals under the right conditions. Crystals have often been exploited in technology. Watches, for example, can employ a quality of crystals that causes them to vibrate at regular frequencies when electricity passes through them. 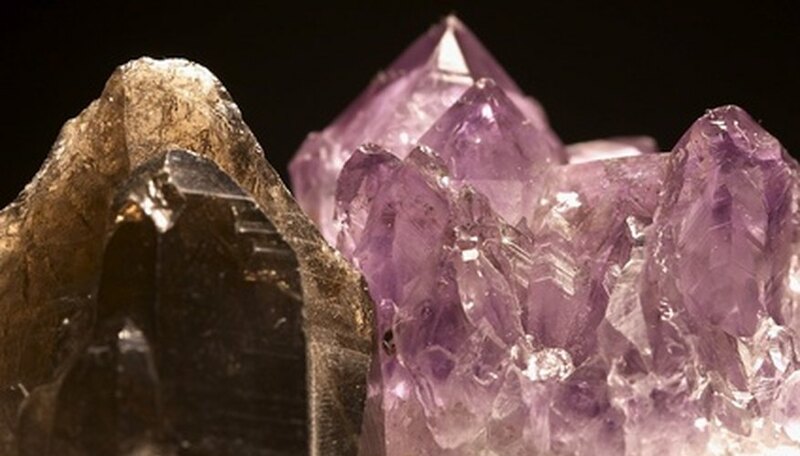 Crystals are used in lasers to energize light particles. Solar cells use a kind of silicon crystal to extract energy from the sun. Brian Jung has been writing professionally since 1991. Currently he works as a software developer for University Hospitals in Cleveland, Ohio, where he also contributes reviews and commentary on children's and young adult literature to his own blog, Critique de Mr Chompchomp, and to Guys Lit Wire. Brian holds a Doctor of Philosophy in English from the University of Wisconsin, Milwaukee. How Does Temp Affect the Growth Rate of Crystals? Jung, Brian. "Science Fair Project: Growing Crystals." Sciencing, https://sciencing.com/science-fair-project-growing-crystals-6663451.html. 25 April 2017.